I had high hopes for Greece. Difficult times test a people; they push them to their limits, they lay bare their instincts and prejudices; they remove their shelters and they force them to confront reality in a new way. How people react speaks to their character and to their courage. People can try to deny reality. They can cling to old ideas and habits in an effort to “turn back the clock.” They can put their heads down, retrench and wait out the crisis. Or they can grasp the new, reset and fight anew. Two years since Greece first turned to the international community for help, and in the eve of a national election, where exactly do we stand? 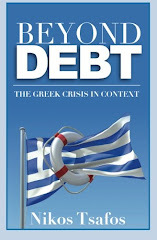 No doubt Greece faced a crisis that was as deep as it was fundamental. It transcended economics and finance and went to the core of who we are as a people. It would test assumptions that Greeks held for generations. It would force us to rethink the role of the state, the responsibility of the individual to society, our sense of fairness, and our understanding of what we should reward and condemn as a people. The crisis was the world’s way of saying we needed to take another look at ourselves and our ways. It was a test and an opportunity. Greece’s instinctive reaction was correct. We made an honest effort to honor our obligations to our creditors and to our partners in this monetary union. We eschewed a catastrophic default that would have unraveled the Eurozone and the European banking system. We pledged to make reforms and we succeeded, in 2010, in cutting our deficit and making needed changes. Those first six months were a grace period. Any government, especially in a national crisis, gets the benefit of the doubt. I remember a friend telling me in late 2010 that what surprised him the most was how little the Greek people had protested and how quietly they had acquiesced to major changes. But that grace period subsumed three different sentiments. The first was passivity. New government, new taxes, new laws – what can you do? It’s a crisis and it will pass. The second sentiment was denial. Those reforms are meant for others, not me, so why worry? I am doing well, thank you very much, and I have no problems with reforms in general as long as they leave me alone. The third sentiment was hope. Might we finally fight corruption and tax evasion? Might we curb spending and scale back the state? Might this be the change we’ve been yearning for? As we reached the one-year anniversary of the bailout in May 2011, several things became obvious. First, no more grace period. Second, this was clearly going to be neither a short-lived nor a mild crisis. It would last long and it would wipe out a sizeable portion of the country’s wealth. Third, everyone had to change and no one was beyond the reach of the memorandum. Fourth, our government lacked the backbone to see us through what was emerging as an existential crisis. These realizations upped the ante of social struggle; they compounded the sense of anger and frustration from people who thought either too much was happening or too little; they underscored the need for a new bailout and possibly a partial default; and they exposed that the government had an expiration date that was fast approaching. In that context, the paralysis of the government and the gradual disintegration of core state functions pushed a people closer to the brink and towards exhaustion. The gap between what people were expecting and hoping for and what was possible became wider and wider. No wonder there was a massive political vacuum emerging at the heart of Greek politics. That we have as many as ten parties flirting with entering parliament speaks to just how fragmented, disjointed and confused our national politics have become. In Sunday’s elections the people are going to mumble rather than speak. They will say that they are angry and disappointed, and that they want something different. But they will not point in any one direction. Not only are there so many people who remain undecided, but the basis upon which they will decide is likely to be shallow. Back in October 2011, I wrote about Greece’s political vacuum and the three ways to fill it: extremism and polarization, cynicism and disengagement and the creation of a new social contract to promote liberal reforms. Cynicism and disengagement are by far the most dominant reality, although this is being manifested (and it enables) extremism and polarization. What worries me most is that the protest vote will take it too far. A strong showing for the far left is akin to saying “I still don’t get what happened to Greece.” A strong showing for the far right is akin to saying, “my desire to protest trumps my common sense.” this has been an endemic problem for Greek society – the inability to distinguish between the right to protest and the act of protest itself. Just because you can do something doesn't mean you should – this is still something that the Greek people haven’t quite grasped. Yet this election will reinforce something that the Greek people have avoided and evaded consistently over the past two years – that no matter what the international environment, no matter what happens in Brussels or Berlin, the fate of the country ultimately rests in Greek hands and the choices that the Greek people will make on May 6. If they choose to merely protest, they shouldn't be surprised at the results later on. We choose our fate and we have chosen poorly so many times. Do so again and we have only ourselves to blame. Once again, compliments on your article! For me this election has been a massive wasted opportunity. What I and many people want to hear about is what sort of Greece we want to be living in in 20 / 30 years. The really big questions have been skirted around. How, for example, can tourism been reshaped to learn from the 'build it high, sell it cheap' mistkes of the past? How do we return to growth with a shrinking population? What role, if any, will immigration play in this? How will immigrants be integrated into Greek society? How do we keep our best young minds in the country? How can we build a university system worthy of the name? "An Election Two Years After the Greek Bailout" leads to chaos, an originally Greek word. Dear Nikos, what do you think? My personal opinion: Greek won't make it with the Euro, they should take the Drachma back. There is no will among politicians to change a system they benefit from, the Greek population is easily attracted by populism and there is no industrial basis to be able to have a currency as strong as the Euro. This cannot end well. I seriously hope Greek takes help from the EU now and leaves the Euro.